Phillip Broderick : Basket Range Wine. Just after I posted the interview with Xavier Bizot, Phil Broderick rang me and commented how much he enjoyed Xavier’s interview. 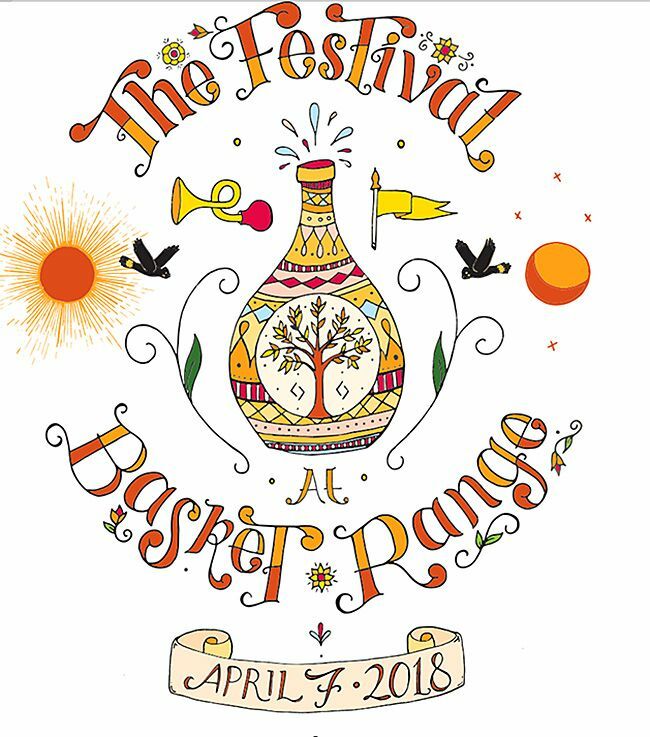 The Festival at Basket Range, Saturday April 7th. One of the things I love about wine is getting to know the diverse people that are involved in the wine trade. 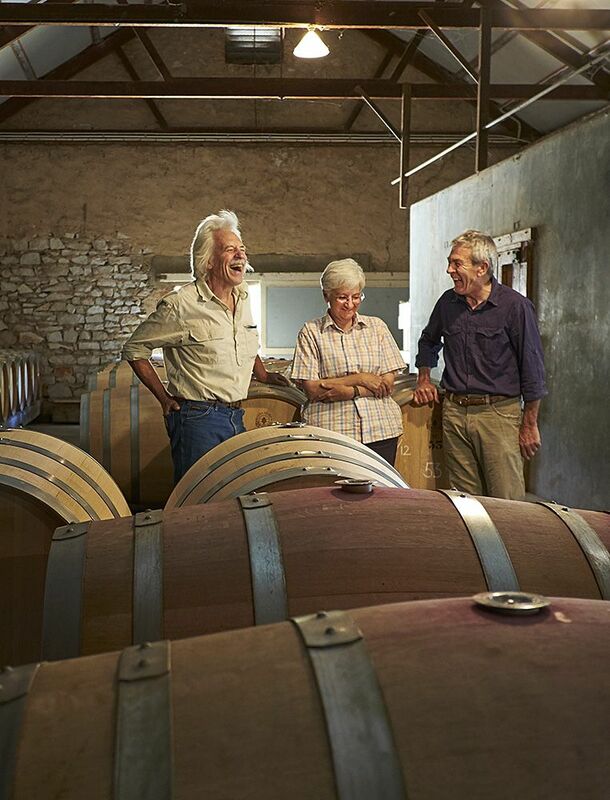 Xavier is from a well established wine family in France, Phil is a full time working magistrate whose been growing grapes and making his own wine for nearly 40 years in the Basket Range. Quite different backgrounds with one thing in common, a passion for wine. 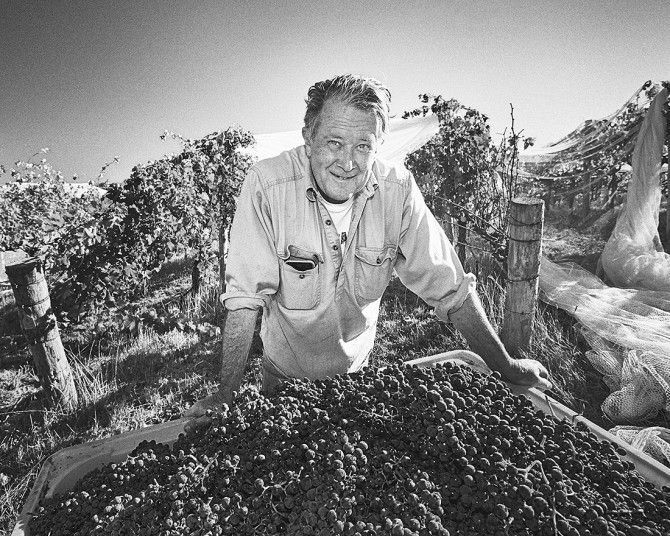 Phil first planted grapes in 1980. He and his wife Mary are often referred to as the ‘Original Basket Rangers’. If you are reading this before Saturday April 7th get along to ‘The Festival at Basket Range’. 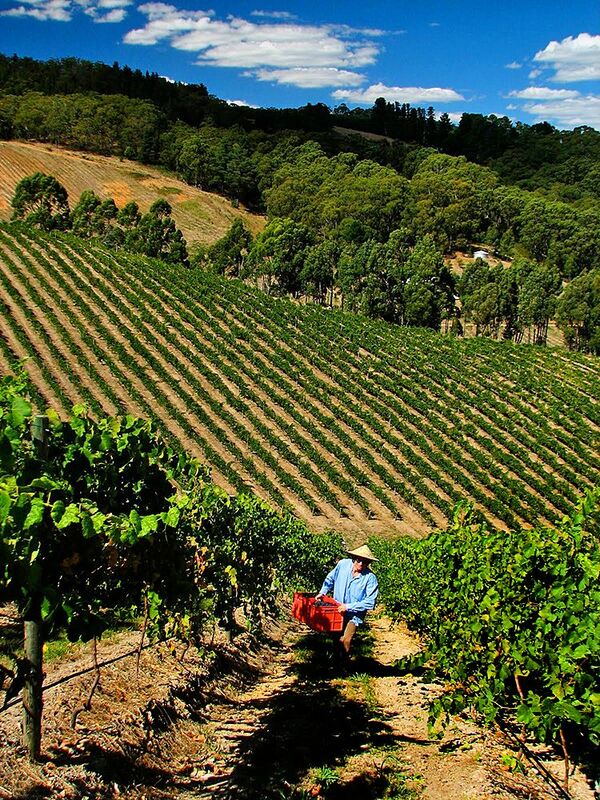 In the heart of the Adelaide Hills, Basket Range is often described as the epicentre of the Australian natural winemaking scene. Phil does not quite fit that mould, although he happily admits to changing many of his views. You and Mary have been described as the original Basket Rangers, why did you plant there ? In the early 70’s I was at Adelaide University studying law. During that time I lived in shared rental houses. A good friend owned a house and land in Basket Range, I lived with her for a while then moved back to town and continued legal work, which still goes on. She wanted to sell the property so I bought it in ‘78. That was where the first vines were planted in 1980. Stephen George with Lita and Tony Brady at Wendouree : Photo © Milton Wordley. It’s down the hill from where we are now but is still “next door”. I knew Stephen George when he was living in Clare. 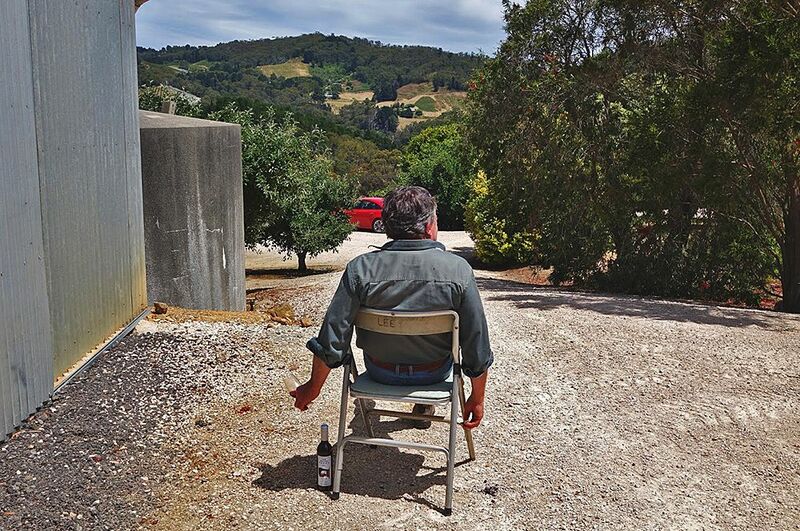 He moved to Semaphore in the late seventies and bought the property in Ashton in the early eighties, now the site of Ashton Hills, with his late partner Peta Van Rood. So I thought bugger it, I’ll put in some red grape vines with no grand plan, just because I always liked red wine. I thought the area looked right as that part of Basket Range grew very good berries, cherries, apples and pears. I put in the first patch as a start in 1980. Peta’s father was also generous and helpful – he gave me a bit of advice together with Stephen. In fact the whole community has been like that over the years. At the time the “local” locals told me I was mad and that I’d get wiped out by frost. But the frosts are in mid to late winter and down in that gully where the first vines were planted, it gets bloody cold. On occasions there has been frost all day – but by bud burst that threat has passed. There was never damaging frost, so I was alright. 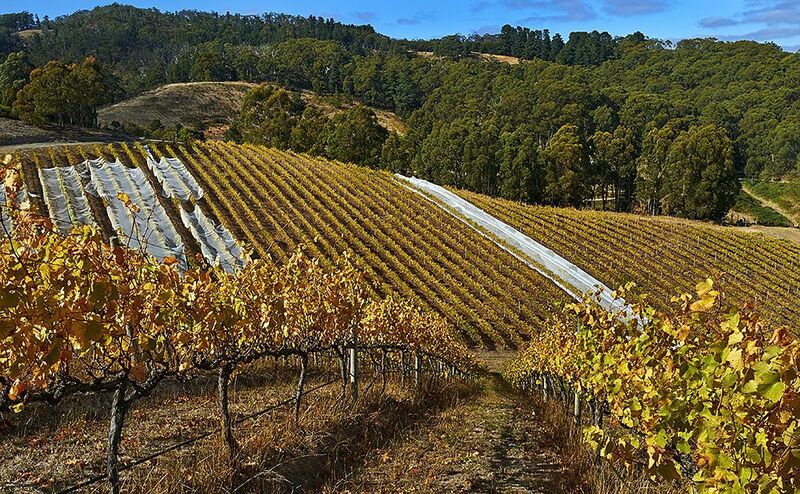 Basket Range is about a 40 minute drive into the Adelaide Hills from the CBD. Early life and why wine ? My parents were both teachers. 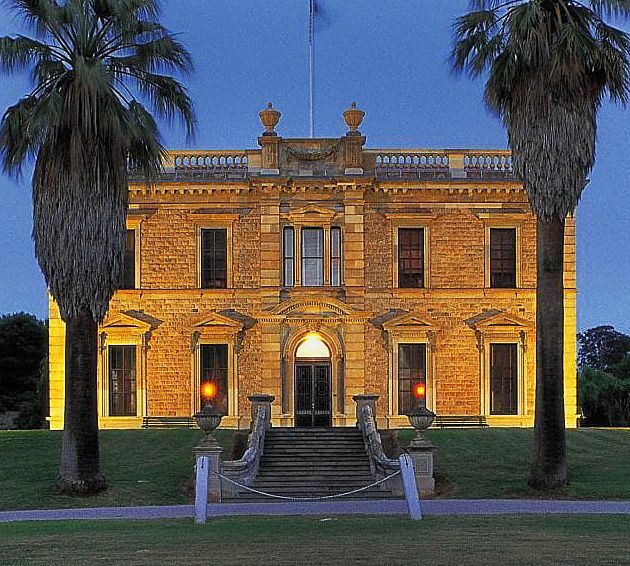 The wine thing just happened really – I am of the generation that came out of the Barossa Pearl wilderness I suppose. Also I used to spend my summers in Port Lincoln from about thirteen with my Uncle Jesse, who married my mother’s sister. Jesse used to shoot at the ‘Ungarra Gun Club’ monthly on Sunday afternoons. All local farmers with weather beaten faces – the top of their foreheads white from wearing a hat everyday. The traps were in someone’s paddock. There would always be a bbq after the clay bird shoot and somebody at some stage brought tinned claret along. Seems odd now, but wine in a tin was my introduction to red. It was about 1966, my father and Uncle Jesse enjoyed a claret or three, I’d sometimes join them. I loved going to the West Coast for summer holidays and I loved Jesse, so it was a joyful association right up until he died. At university in about 1972 Geoffrey Badger, the Vice chancellor of the University of Adelaide, got about half a dozen of us to go and live at Martindale Hall (Mintaro) for the summer, essentially undertaking maintenance work. There were politics with the bequest from the Mortlock family. 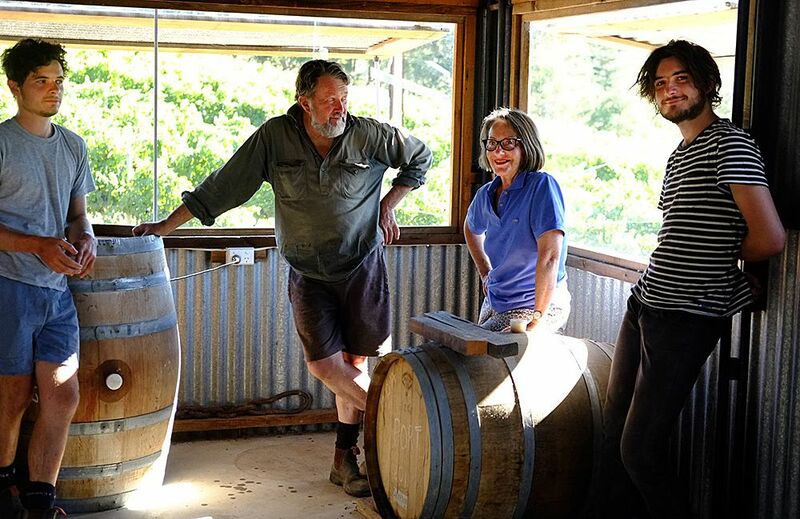 That time introduced me to Mintaro and the Clare Valley – and then or shortly thereafter I met Stephen George, and through him, a connection with Tony and Lita Brady at Wendouree. The steep Basket Range Wine vineyard : Photo © Milton Wordley. You planted Bordeaux varieties in the gully : then moved to the top of the Hill. Why ? Yes the first plantings in the gully were red grapes simply because I liked them, Malbec, Cabernet, a bit of Cabernet Franc and Merlot. 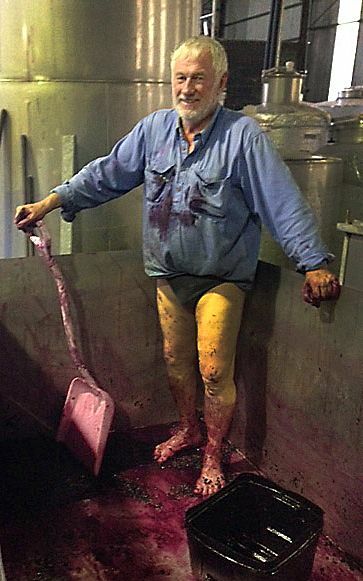 The problem with growing grapes in a cool Adelaide Hills gully was that was frequently too cool. It’s a very steep block to pick on : Photo © Michael Boys-Green. The sun never got on the vineyard in summer until about 8 am and the fruit set was a bit problematic. The fruit ripened but it was always right at the end of the season – on a few occasions we would be picking in late April. In 2001 our neighbour Doug Watson was selling. We were looking to expand if we were going to be at least half way viable. This current block works very well for us. Its pretty steep in places. Graham Jepp, who managed the Ashton Cold Store for 50 years, told me when we bought it that the Watsons grew the best apples in Basket Range. We planted the same grape varieties as in the gully, but also pinot noir and more petit verdot. The original vineyard was tiny. This, the current place, is twelve acres, wish now it was a bit bigger. In the early years, before I went to Sydney for work, around ’87 and while I was there, my late father, Jack, kept the place going. He was around for all the vintages. He was the backstop, unconditional help. Do you still have any Apples on the block ? We still have a few. Louis our elder son has been making cider plus using fruit from the immediate neighbours. He makes a barrel or two each year. He’s been doing that longer than making wine . You work full time as a Magistrate. Did you study winemaking ? It’s all been gloriously hit and miss – I’ve been blithely going along for years. John Greenshields during vintage at Ten Miles East. My technical knowledge is pretty basic I can tell you – I really miss not having the scientific discipline at my fingertips. I have always asked questions of people who know these things. People like Stephen George and John Greenshields, the former owner of Ten Miles East at Norton Summit. Brian Croser was also helpful in the early days, he gave me a corner of his winery at Piccadilly to make some of the first attempts. His staff did the plunging if I couldn’t get there. At an early Hills Wine Show at the original Aristologist in Uraidla, a judge said my wine tastes like a St. Emilion. I am reported as saying “Who’s Sondra Millyon?”. It wasn’t quite like that – but I really had no idea . So I made St Emilion a bit of a holy grail – I even made a pilgrimage there in 2014 with Mary and Sholto, our younger son. The village of St Emilion is a medieval treasure (like a lot of the bits of France I have seen) but the atmospherics with tourism make it a bit like Hahndorf these days – it missed the mark for me – I prefer other regions like Cahors or the small parts I have seen – of the Auvergne. I took their sound advice for the impaired. 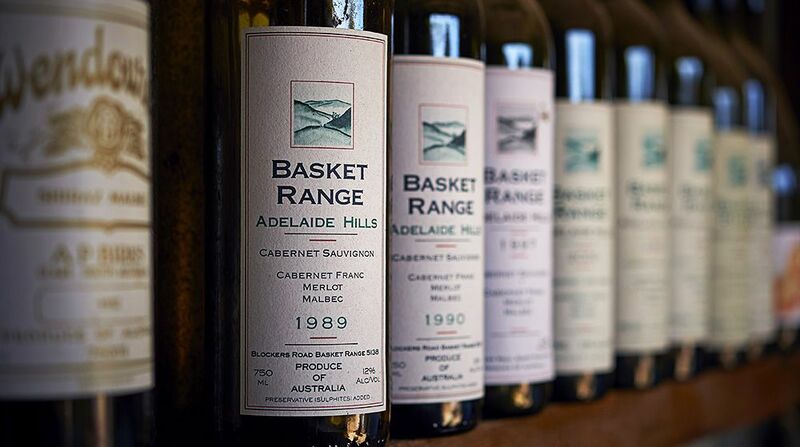 “The Broderick’s Basket Range brand now adorns some of Australia’s very best blends of the Bordeaux varieties: sublimely-perfumed, perfectly elegant red wines. They’re on a par with the beautiful Blue Poles blends from Margaret River”. What style of wine are you striving for ? I love soft French Bordeaux wines (of the few I have tried) – tannins and elegance, especially when they have a reasonable amount of age. I like to think our wines do as well. The 1989, one of the first vintages : Photo © Milton Wordley. We’ve opened up nineteen – twenty year old wines and they are still holding together. I think the ’98 and ‘07 are the best wines that I’ve made, we only have a couple left. 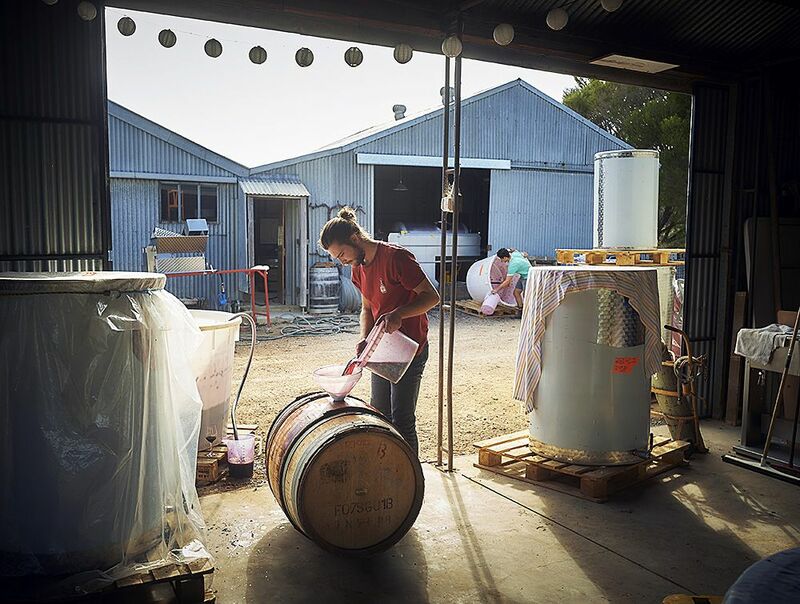 Louis and Sholto at work during the 2018 vintage at their ‘Basket Range Wine’ sheds : Photo © Milton Wordley. The 2006/2007 vintages were the cross over between the old place and the new. The ’07, was a blend of mostly Cabernet about 60%, Merlot and a bit of Petit Verdot. We have really made that style our blend. I recall some of the great Coonawarra cabernets from the 90s – that lovely tannin – crushed grape-seed I call it. I’ve had a few and I thought to myself, you know just give up … but anyway – I aspire to making a cabernet like that. Your sons Louis and Sholto are both making wines. How do you Mary and the boys work together ? My wife Mary is a Queenslander, we met in Sydney when I was living there and married in ’89. The Brodericks : Photo © Marta Davis. She has been the major contributor and helper since the early days. She was interested in it but it was hard. Working nearly full time and the boys were young. She was incredibly supportive, all the spare cash going into this and not much going anywhere else. She’s got a bloody good palate, I always refer to her when blending. In fact I reckon if you are doing blends – make sure you’ve got a couple of women in the line up – they must have more taste buds or something. The two boys have taken a big interest in it recently – particularly the last two or so years . 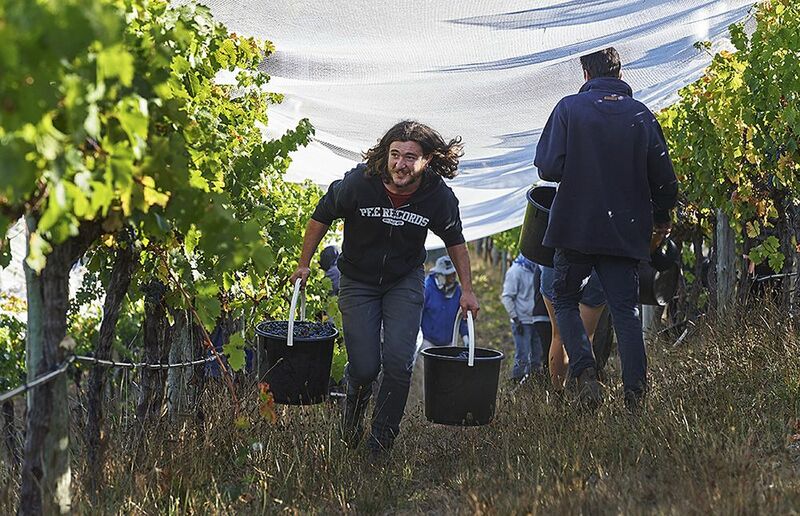 Sholto the younger is studying Oenology at Adelaide – he should be finished by now but he and his older brother Louis took time out the year before last to go to France and do a vintage over there. They work well together, they work harmoniously. 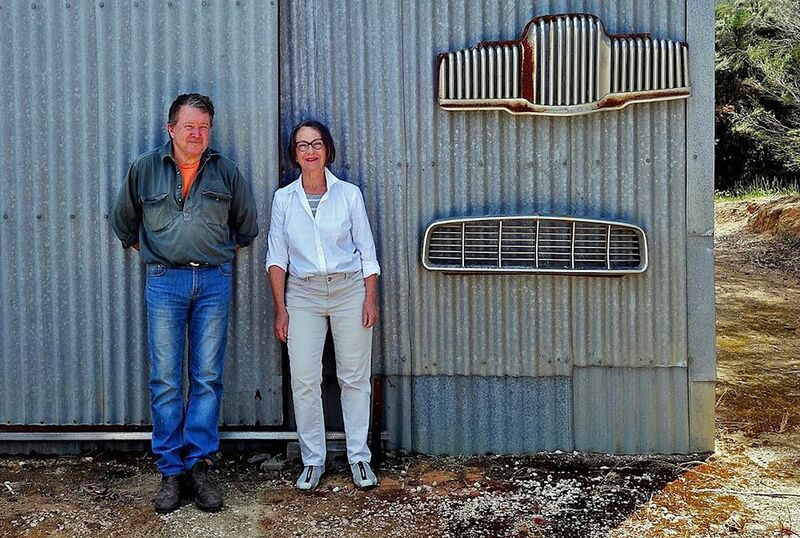 Louis and Sholto during the 2018 vintage at their ‘Basket Range Wine’ sheds : Photo © Milton Wordley. Having them work with us has taken a lot of the pressure off me. I’m stepping back and doing a smaller amount…. We also have outside help from their contacts interstate and overseas, particularly at vintage. Seasons in the Hills ? Winter is the favourite month for me except if it gets a drudge with the rain – but you can put up with any amount of that. The worry in the Hills is and always has been the fear of bushfires. The 2013 bushfire came our way from Cherryville, crossed over the hill. ‘Ash Wednesday’ The Adelaide News front page. Our neighbour around the corner lost his house. It was May with a steady north wind, I thought we were going to lose everything. Sholto was home, Mary was in Sydney and Louis was working in town. There have been some really bad bush fires in the Hills. I was the last person who got up Norton Summit Road in 1983 (Ash Wednesday), there was just this rain of ash. 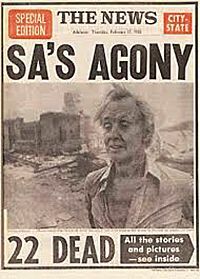 I remember going to see Stephen that night – driving over there were strainer posts and some sheds alight, it was a scary and bizarre day. And of course the catastrophic ’55’ fire changed the local demographics. That was the fire which destroyed Marble Hill the Governor’s summer residence, which is now being restored by Patricia and Ed Michel. So yes bushfires in summer and snakes, just to keep you leaning forward in the fox hole. Harvest 2018 : Phil say’s he has “this lovely team of Laos people who’ve been with us for ten years. They’re here rain hail or shine. Always smiling. Very generous, very honest. Very hard working. They’re adroit. Very fast pickers. I just have enormous respect for them. Without them we couldn’t do it. The country here is very steep. On a hot day, it’s no picnic” : Photo © Milton Wordley. In past vintages we often sell small amounts of fruit to a few of the local winemakers. 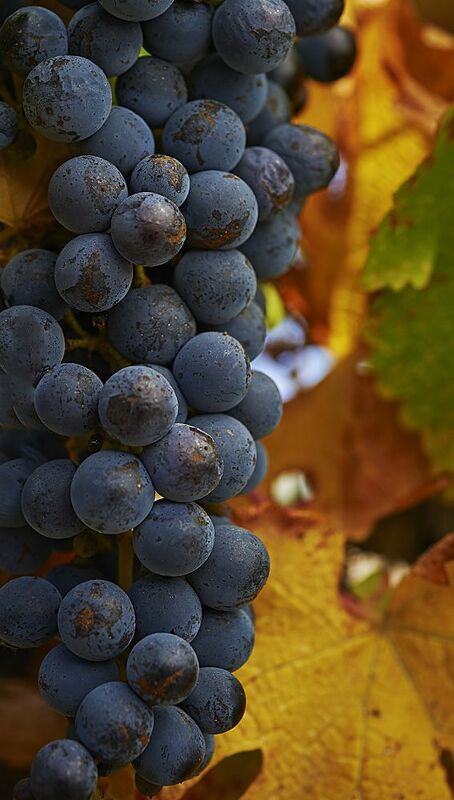 Autumn 2018 Cabernet ready to harvest : Photo © Milton Wordley. But this year we have had to reduce them all because the yield is so low. That aside, what has come of it is very good in flavour and clean fruit. This is another Indian summer year like ’90 and ‘02. We will finish in a week. I am keeping a small bit of petit verdot on the vine for more flavours. The boys have taken all of theirs. Natural Wine ; Basket Range, there’s been plenty said and written about that. The boys are both of the new school – they like lighter more acidic wines than my palate appreciates. For me, you’ve got to get flavour, you’ve got to get structure, you’ve got to get mouthfeel and texture. I’m not talking ‘Jam Bombs’, not at all – but you don’t get those qualities out of really acidic just barely ripe grapes. 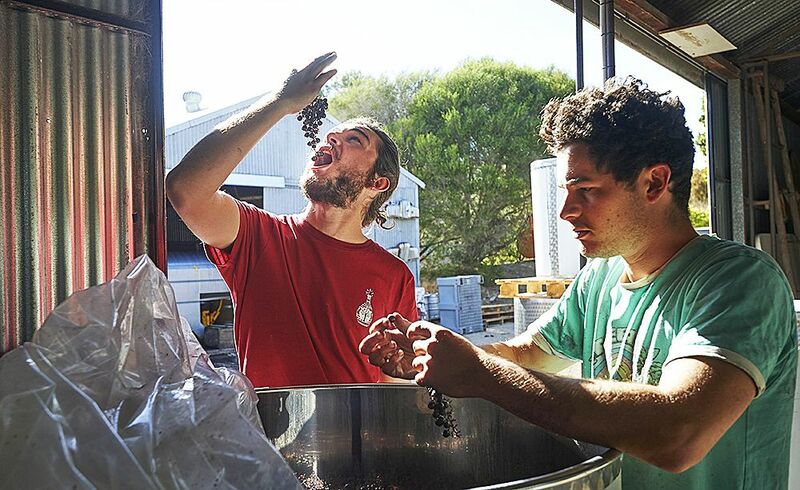 I think the boys now appreciate that if you are going to make wine the standard is that people, with goodwill who enjoy it, regardless of ideology, are going to say “Yes that’s a nice drink…” full stop. 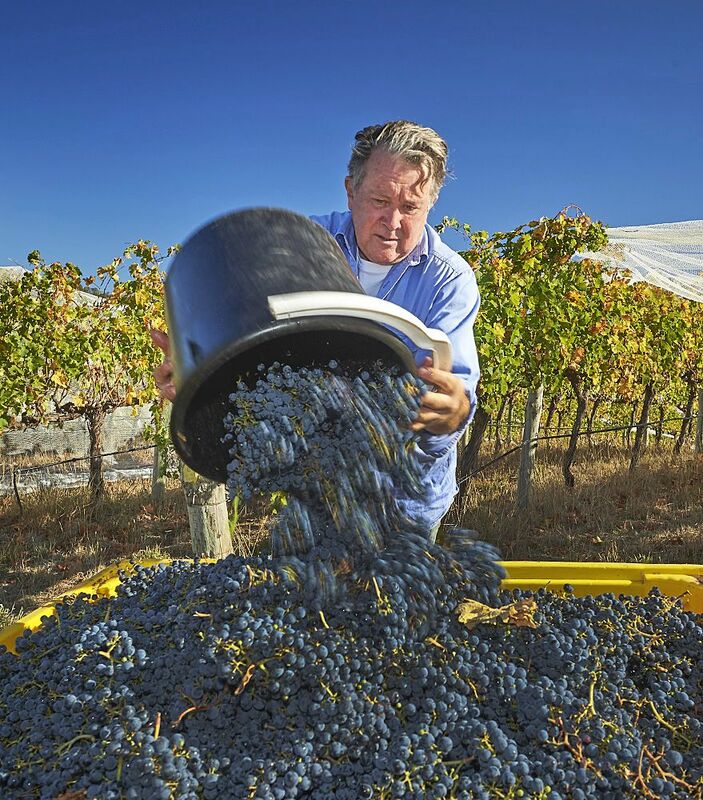 Phil during harvest, it’s all hands on : Photo © Milton Wordley. That is the criterion, nothing else. Not whether you use a sprinkle of sulphur or anything else. 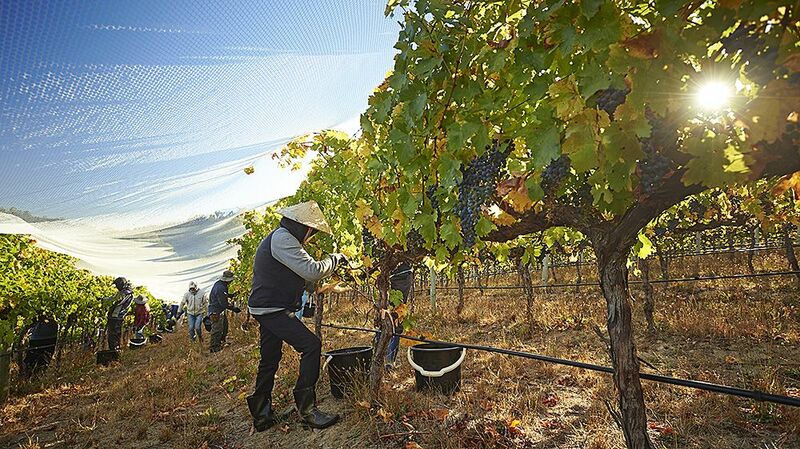 Good wines are produced in the vineyard and are made with minimal interference but attention to detail in the shed. In the last four years we’ve used no glyphosate and only apply copper and sulphur. Certainly in terms of the soil structure that is showing improvement. My idea of making wine and managing a vineyard is akin to how farming, as it was carried out around here just after the war to the late 50’s. Everyone’s had a tractor by then, no industrial spray regimes and land managers around here seem to have had a good sense of observation and balance. One example is the way codling moth in apples was generally controlled. You grew rhubarb under your trees – you had a minor cash crop with the rhubarb and it kept the moths under control. Simple stuff that is just so blindingly obvious and balanced. Brian Walsh : Wine Australia chairman.